This company is the biggest buyer of Uganda tea at the Mombasa tea auction with last year 2017 having bought 10,233,391(kilos). The two discussed a wide range of issues relating to tea among which included; the challenges affecting the price of tea from Uganda which overall stem from the quality of tea that is produced as a result of poor husbandry from the time of handling, plucking the tea as well as handling of the tea at the time of production, competition for the green leaf from the many processing companies against the few growers located far from the factories, lack of clear body to regulate the tea industry. The Head of tea sourcing commended that Uganda has the potential to produce high quality tea because of the favorable factors it has such as rich soils and moderate rainfall required for tea growing. He underlined that biggest consumer taste of Uganda tea as from Sudan, Egypt, Pakistan and Russia among others. The Consul General reassured his host of Uganda's continued efforts to see that the quality of tea is improved. He also noted the need for close cooperation between the government and the stakeholders in the tea sector to address the quality issue.The Consul General pledged his commitment to inform the responsible stakeholders of these challenges as well as follow up on areas that require bench marking with growers of tea in the region and best practices. 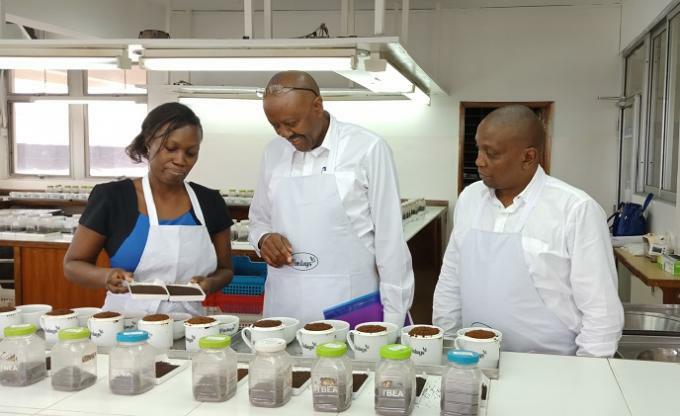 The Ambassador was later on given a guided tour of the tea tasting facility as well as the tea factory where the tea is blended and packaged and the warehouse facility where it is stored. The Company buys tea of McLeod Russel, Kayonza, Kinkinzi Tea, Ankole, Buhwejju Igara, and Toro among others.